Pink, Olive 1912 , Olive Pink Collection. Watercolour and pencil on card sketched by Olive Pink, from Kalamunda, Western Australia, 1912. Line drawn diagonally across card separating pictures. Top section "V" identified by Olive Pink as a Grevillea. 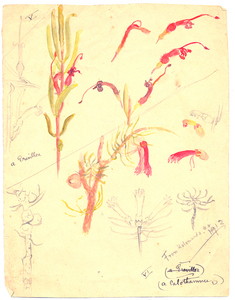 Bottom section "VI" identified by Olive Pink as a Calothamnus (above has "a grevillea" crossed out) , University of Tasmania Library, Special & Rare Materials Collections, Hobart.